Speaking at a rally in Raiganj, Rahul said Modi wants to create one India for his friends like Nirav Modi, Mehul Choksi and another for the poor farmers and honest people. 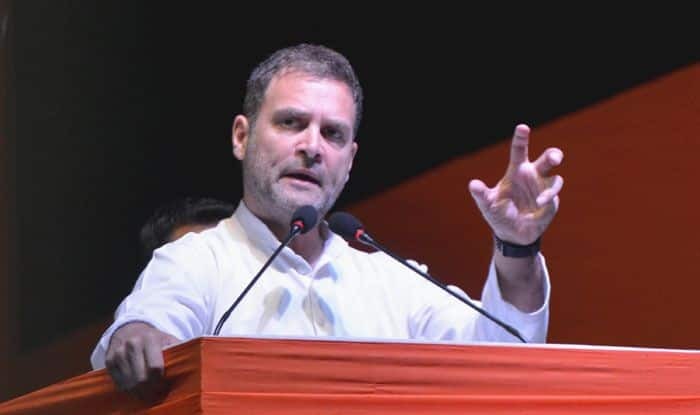 Congress president Rahul Gandhi on Wednesday sharpened his attack on Prime Minister Narendra Modi accusing him of trying to create two Indias – one for his “friends” like Nirav Modi and Anil Ambani and another for poor farmers of the country. Gandhi said that if Congress is voted to power, he will ensure investigation into the Rafale scam and that the guilty including Prime Minister Narendra Modi is put behind bars. Hitting out at West Bengal Chief Minister Mamata Banerjee for forging an alliance with BJP in the past, Gandhi rubbished her allegations against the Congress. “It is the Congress which is fighting tooth and nail against BJP in the country,” he told an election rally in north Bengal’s Raiganj. Alleging that the “facial expression” of Narendra Modi has changed, Gandhi said, “He can’t speak properly at various rallies. This is because he is afraid that because of Congress there might be an investigation into the Rafale scam and he might go to jail,” Gandhi said. Referring to Congress’ NYAY scheme, Gandhi said the funds for giving Rs 72,000 per year to the poor would come from the pockets of businessmen Anil Ambani, Nirav Modi, Mehul Choksi and Vijay Mallya who have looted the public money. “Modi wants to create two Indias – one for his friends like Nirav Modi, Mehul Choksi and another for the poor farmers and honest people. Congress will never allow this. I am not afraid of thieves like Vijay Mallya, Nirav Modi and Mehul Choksi. Narendra Modi might be,” he added.